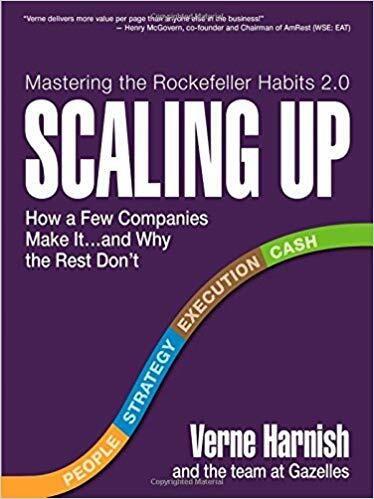 In Scaling Up, Verne Harnish and his team share practical tools and techniques for building an industry-dominating business. These approaches have been honed from over three decades of advising tens of thousands of CEOs and executives and helping them navigate the increasing complexities (and weight) that come with scaling up a venture. This book is written so everyone — from frontline employees to senior executives — can get aligned in contributing to the growth of a firm. Scaling Up focuses on the four major decision areas every company must get right: People, Strategy, Execution, and Cash. The book includes a series of new one-page tools including the updated One-Page Strategic Plan and the Rockefeller Habits Checklist™, which more than 40,000 firms around the globe have used to scale their companies successfully — many to $1 billion and beyond.